"On that day, if a man is on his roof, he will not have time to go inside and get his things. If a man is in the field, he cannot go back home. Remember what happened to Lot's wife? The person that tries to save his life will lose it. But the person that gives his life away will save it." Jesus' coming will be sudden and surprising. We must be ready for that coming at all times. There won't be time to prepare to go with him or to be ready for him. The things of this world will dim in comparison to the glory of his coming and the glory of our going home to God. Nothing should be allowed to interfere with this one great opportunity. Nothing! Father, God Almighty, give me an undivided heart and undiluted passion for Jesus' return. I know it will occur unexpectedly and will happen quickly. I want to be ready. I want to be excited. I want to have no reservations. 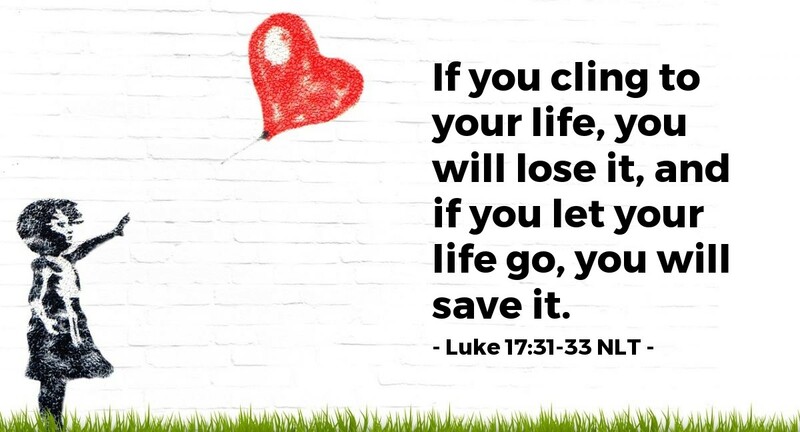 Please, dear Father, I don't want to cling to life here, but to expect your greater glory when Jesus returns. In Jesus' name I pray. Amen.